With the explosive growth of online marketing, many industry experts claimed that we’d see a measurable contraction of television advertising budgets. Over the last few months, dozens of news outlets ran articles that reported 2017 would be the year online advertising spend would surpass total TV spend. They were right, but what they often didn’t explain was that the amount spent on TV advertising has been increasing year over year, almost without break, since the inception of TV advertising in 1941. According to MarketingCharts.com, TV advertising spend in 2016 increased by 4.4% year-over-year. In addition, many specific TV advertising spots increased considerably in value: The average cost of a 30-second ad run during Sunday Night Football increased by 6%, up to $615,000 per spot. How does TV advertising converge with martech? By now you’ve probably seen a pattern in our #MarTechMonday posts: heavy coverage of all things martech, but with a strong leaning towards DIY guides, martech comparisons, etc. This week we’re taking a slightly divergent course to cover an up-and-coming martech advertising medium: YouTubeTV. Google has tried to play in the TV advertising space in the past. In 2007, Google began allowing AdWords advertisers the option of buying TV ads that it would distribute nationally via its TV partners Bloomberg, Dish Network, DirecTV, Cox Media and others. After a valiant effort, Google shut down their AdWords-based TV advertising option in 2012. This time around is different: Google is vertically integrating itself into the actual medium of TV first — ads come later. Alphabet, the parent company of Google, recently announced that Google would be offering streaming TV services via YouTube TV. Allowing consumers to truly cut the cord of traditional TV providers, YouTube TV offers its programming for $35 a month, and is on a month-to-month contract. Google has quietly rolled out YouTube TV and is initially offering it in only five test markets: Los Angeles, San Francisco, Chicago, Philadelphia and New York. Unlike most of their product rollouts, Google is not even talking about advertising options at this time. While they most certainly have plans for expanding their advertising reach into YouTube TV, they are currently being tight-lipped about this ad channel. 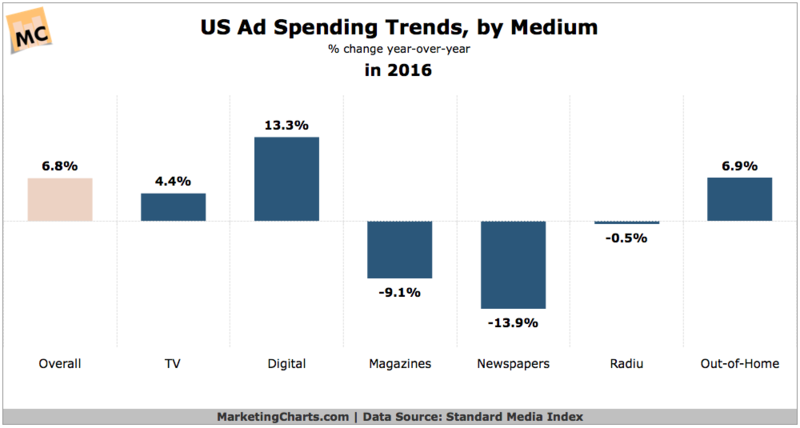 As you can see in the graph illustrating year-over-year growth in U.S. ad spending, digital and TV advertising have both seen strong growth (13.3% and 4.4% respectively). What will happen when digital advertising and TV advertising merge as complementary advertising media? No longer will you see one set of ads online and then a wildly different array of ads on TV. Google has long offered cross-device advertising and attribution via AdWords. You can currently target ads to an individual when they are on their desktop, laptop, tablet or mobile device. That’s where it stops though. In the near future you will be able to get targeted ads in front of people in one additional device: their TV! For years now, online marketers have had the privilege of leveraging big data in their advertising efforts. The martech in the big-data advertising-enablement space has expanded dramatically for online advertising but has left TV advertising relatively untouched. While Google is tight-lipped about the deal they’ve signed with their TV stations, it is believed that they have 2 minutes of advertising each hour. Those 2 minutes will be tied into cross-device advertising campaigns and will begin to return a robust set of advertising data. For example, you visit a website and don’t end up purchasing what you were viewing, so you automatically enter a retargeting campaign the vendor has set up. As you surf the web you start seeing ads from this vendor pitching the product you were evaluating. You don’t buy off these retargeting ads. Then though, as you’re watching TV on Friday night, you see a TV advertisement for this same product. The TV ad is customized for you, showing you the exact features that you’ve been clicking through on the retargeting ads. The next morning you go online and purchase the item. Behold, the power of big data on TV advertising. 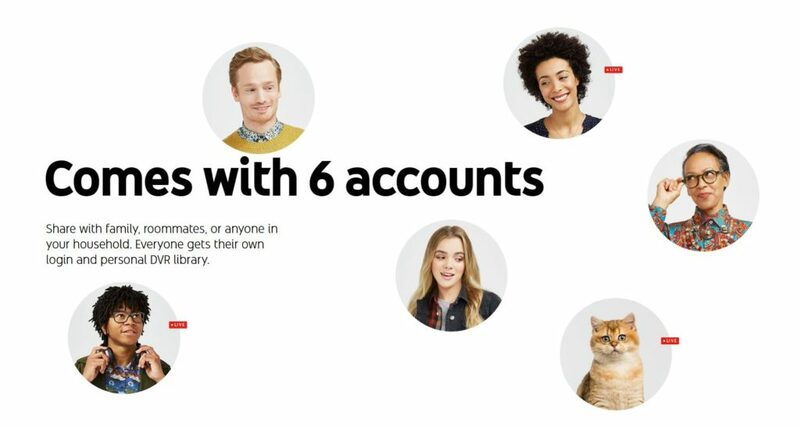 Note: One big indicator that Google is ramping up for cross-device tracking and the enablement of big data on TV advertising is that they are offering six accounts per household for viewing and DVR-ing TV. This way, they know precisely whom to target ads to in a given household. Each household member will receive certain ads based on his or her online interactions. Due to the nature of delivery of YouTube TV, streaming over the Internet vs. cable/airwave transmission, Google will be able to more closely link its advertising to online calls-to-action. For example, most of the TV consumption will occur through an Internet-enabled device. If you’re viewing TV from your phone, tablet or a computer, you can simply click on the TV ad to interact with it. If you’re watching TV on a smart TV, then you can often click (with the remote) on an ad and have it pull up an interactive experience. Or imagine taking it further in our IoT (Internet of Things) world… Last week you visited the mall and entered the clothing retailer H&M. Because of the power of Bluetooth beacon-tracking and big data integrations with retailers, Google knows that you didn’t purchase anything but that you did spend 27 minutes in the men’s fine dress apparel department. Imagine sitting in front of your TV and an H&M ad turns on featuring the same suit you were looking at just a week earlier. It offers a steep discount, and you decide to purchase. You mute the volume of your TV and say “Alexa, order me the H&M suit I just saw on TV.” Alexa enters a dialog where she asks for your sizes and then places the order. As far-fetched as this interaction may seem, it is completely possible with today’s technology! YouTube TV will take us one step closer to making this scenario a reality. How is it different than SlingTV and DirecTV Now? SlingTV and DirecTV Now already offer a streaming TV service. YouTube TV is not charting new waters here. The actual TV channels offered, the pricing of service, and the features you’ll get between these three networks is insignificant. The significant difference, however, is that YouTube TV will be tied into the digital marketing behemoth of Google. While it doesn’t currently have tie-ins to Google AdWords, it is only a matter of time before it does. Google has negotiated with the TV channels on its offering to have 2 minutes per hour of programming for their own sourced ads. Soon you’ll see the power of digital advertising cross into TV ads. I have several clients that run advertising online who have been itching to expand their voice into local markets and expect that they’ll be early adopters of YouTube TV advertising, once it is live. Comment below to share how you envision using TV advertising to expand your martech advertising reach.